Woman: (frightened) Sir, are you okay? Me: No. No. I’m not okay. I’m NOT okay. I’m not OKAY ALRIGHT!!!! You know why? Do you? 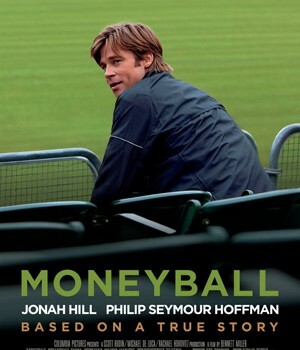 Moneyball. That’s the problem. Moneyball. I stayed up all night watching that film. Over and over. I read the book. I mean, I loved the book. It fueled my deep and undying passion for baseball stats. It was fascinating. VERMONT! I mean, Michael Lewis is a heck of a writer. But….THE MOVIE!!!! Ehhhhh!!!! Vermont! Woman: (staring straight ahead in utter terror) The….movie? Me: It’s absurd. Absurd! They turned the thing into a Merchant-Ivory picture! All the edge of a five-year-old butter knife. All the dullness of Out of Africa with the “fight the system”, Occupy Someplace message that Americans love. Mr. Smith Goes To Oakland. Blah blah blah. Of course, the big climax is the film is the main character turning down a whale’s colon full of money for “the love of the game”. If there was ever a part of me that didn’t want so see Hollywood attacked by human eating vultures it died in that moment. VERMONT!!!!!! Woman: (reaching into her purse for either a whistle or pepper spray) Sir, please……. Me: Look! You asked me what I thought about the film! I hated it. Vermont! If you watched the film you’d think the A’s only had Scott Hatteberg, Chad Bradford and David Justice. They had Zito! Mulder! Hudson! Dye! Tejada! Harang! Ramon Hernandez! Not a one of those guys were Moneyballers. And their division sucked! Those were also factors….don’t you think?????? Me: You’d think Billy Beane had a blind second baseman and 9-year-old playing catcher. You’d think Billy Beane climbed Mount Mariah and talked the good lord out of making Abraham sacrifice his son. You’d think he cured smallpox by dialing a few numbers into his computer. VER—–MONT!!!!! Me: And another thing, what did Art Howe ever do to become the worst movie villain since Jack Nicholson put on face paint? Sure, he wasn’t exactly a great manager, but watching this film you’d think he had Frank Menechino’s liver with some fava beans and a nice Chianti. He’s an American League manager! Of course, he’s cold and disinterested! You would be too if you had to watch 162 games a year without even getting to call one double switch. Let’s face it, it’s the most mind-numbing job this side of being Underwear Inspector Number 8 at the Hanes Factory. Woman: (angrily) Are you finished? Me: Am I finished?!? Am I finished?!? VermontvermontVERMONT! You know what stings the worst. The reviews! Reading reviewer after reviewer practically break their collective arms trying to heap praise on this piece of garbage because the director “gets out of the way and let’s the film tell it’s story.” According to most of the Gatekeepers of Good Taste, the best thing an American director can aspire to be is irrelevant. Where are the 12-minute tracking shots? Where is the juxtaposition between Billy Beane and a Chicago Slaughterhouse in the 1890s? No homage to Eisenstein’s Odessa Step Sequence? Only two films get made in Hollywood anymore, the one about the likeable but eccentric character triumphing over some overblown problem or the one about the co-ed trapped in an elevator who can only survive by gnawing off her own leg. America used to stand for something! Is this really the best we can do? VERMONT!!!! Woman: (finally looking at me with a deeply concerned expression)This is my floor. I’m going to go now. This entry was posted on January 17, 2012, 4:47 PM and is filed under Articles I Probably Shouldn't Have Bothered Writing, Blithering Sports Fan Prattle. You can follow any responses to this entry through RSS 2.0. You can leave a response, or trackback from your own site. Where’s Argento when you need him?!?!!? Was interested in watching Moneyball, despite having limited knowledge of the background story, but hadn’t seen Pitt in a movie like this before so it caught my attention. Now, I’m thinking about putting it on the back-burner, while the fire’s on… after I’ve witnessed this possible ‘horror’ for myself. It’s probably much better than I describe it here. Although setting the thing ablaze would have been my response.